Accelerator Mass Spectrometry (AMS) is a mass spectrometric method for quantifying extremely low concentrations of long-lived radioisotopes, such as the commonly used biochemical tracer 14C. AMS can measure attomoles of radiocarbon with a precision of better than 10%. This corresponds to the need for less than 0.1 DPM-equivalent of labeled agent per gram of biological sample. AMS has use when sample is limiting, specific activity is very low, when the level of isotope that can be used is very limited (humans studies) or when trying to study events that occur with very low frequency or at very low concentration. The focus of the Resource is biomedical uses of 14C and 3H. However, LLNL measures other isotopes, such as 41Ca by AMS. For information on capabilities related to these isotopes, contact the Resource staff. The Resource for Biomedical AMS is a U.S. National User Facility Research Resource, and is supported by the National Institutes of Health (NIH), National Institute of General Medical Sciences (NIGMS), Biomedical Technology Research Resources (BTRR) program. 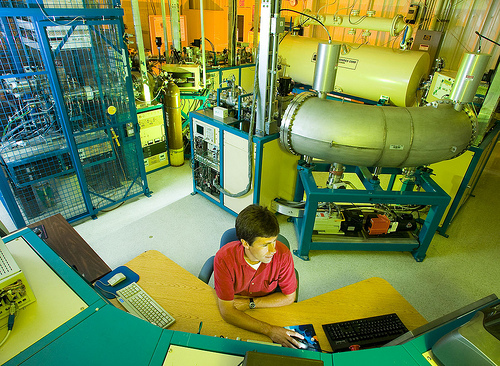 It is located within the Center for Accelerator Mass Spectrometry (CAMS) and the Physical and Life Sciences Directorate at the Department of Energy’s Lawrence Livermore National Laboratory (LLNL). 1. Increase the value and information content of AMS measurements by combining molecular speciation with quantitation of defined macromolecular isolates. Specifically, develop and validate methods for macromolecule labeling, characterization and quantitation. 2. Develop and validate methods and strategies to enable AMS to become more broadly used in human studies. Specifically, demonstrate robust methods for conducting pharmacokinetic/pharmacodynamics studies in humans and model systems. 3. To encourage and demonstrate new applications for Biological AMS and to provide education enabling more biomedical investigators in the research community to utilize AMS quantitation. Training in the use of AMS is critical to ensuring successful use of the technology by biological researchers. We provide the expertise to train and work with investigators, postdoctoral scientists and students using AMS in their research. The Resource is operated under the general guidelines of the National Institutes of Health (NIH), National Institute of General Medical Sciences (NIGMS), Biomedical Technology Research Resources (BTRR) program and the recommendations from a National Advisory Committee. Standardized procedures have been developed for biomedical researchers to obtain access to the Resource. This process entails each potential user submitting a proposal or letter of intent regarding their scientific problem which is peer reviewed for acceptability. Projects approved for incorporation in the Resource will be serviced as time, schedules, and resources permit. Although investigators do not need to have NIH funding to utilize the Resource, priority will be given to research projects that are NIH funded. The Research Resource for Biomedical AMS was established to develop and apply the technology of AMS in broad-based biomedical research. The Resource’s niche is to fill the need for ultra high sensitivity quantitation when isotope-labeled agents are used. This Center is presently the only Resource of its kind in the country. Other facilities are acquiring the capability of AMS and gaining expertise in its use. However, for the foreseeable future, we believe LLNL will continue to be the primary facility providing AMS capabilities in high enough capacity to serve the biomedical science community. We believe new techniques must be developed to broaden AMS’s use where any or all processes within a biological system are possible subjects of AMS quantitation. The Resource continues to work on development of the technologies needed to obtain detailed quantitative information from complex exogenously labeled biomolecules and we will work to develop new methods for analysis of endogenously created biomolecules. The ongoing Resource will address technology gaps in both throughput and precision using continuous gaseous samples for studies in model systems and humans. We believe the major gaps in the continued growth and application of AMS in biomedical research is first the lack of high throughput analysis coupled to molecular speciation that can be solved by the development of an on-line fully integrated AMS-HPLC system. A second gap continues to be the lack of robust methods for quantitative protein biochemistry studies. Understanding how to measure post-translational modifications and how to perform studies for receptor identification based on binding of 14C-labeled ligands with acceptable sensitivity, precision, and reproducibility using substrate concentrations that are within the natural physiological range so that the normal metabolism is not perturbed is likewise important. Likewise, methods to conduct quantitative pharmacokinetic and metabolism studies with biologics needs to be developed and understood for our users who are interested in developing biologic drugs and for fundamental research in protein turnover by our collaborators. We will also continue to develop separation protocols to utilize reduced sample sizes for bomb pulse macromolecular turnover studies and develop methods for macromolecule isolation from archived embedded tissue samples, where we will investigate methods for paraffin removal and dealing with cross-linked macromolecules. All these studies should become more tractable when the coupled AMS-HPLC system is available. Increase the value and information content of AMS measurements by combining molecular speciation with quantitation of defined macromolecular isolates. Develop and validate methods and strategies to enable AMS to become more broadly used in human studies. Increase the accessibility of AMS to the Biomedical research community and the throughput of AMS through direct coupling to separatory instruments. Provide high throughput 14C BioAMS analysis for collaborative and service clients.